On April 19-21, 2012, Professors Emily Beck, Raúl Carrillo-Arciniega, Mark P. Del Mastro, Benjamin Fraser and Carl Wise participated in the 65th annual Kentucky Foreign Language Conference with various presentations of research and sessions. For more specifics on paper and session titles, click here for the complete conference program. Professor Emily Beck’s article “Contemplating the Noble Ethos: Implications for Jewish Converts in the Writings of Alfonso de Cartagena” will appear in the peer-reviewed collection of essays titled ¿CONVIVENCIA? : Muslims, Christians, and Jews in Medieval and Early Modern Spain (Ed. Connie L. Scarborough) that has just been accepted for publication by Juan de la Cuesta Hispanic Monographs. Also, Emily’s book review of Women’s Literacy in Early Modern Spain and the New World (Eds. Anne J. Cruz and Rosilie Hernández. Ashgate: 2011) will be published in the summer 2012 issue of the Renaissance Quarterly. 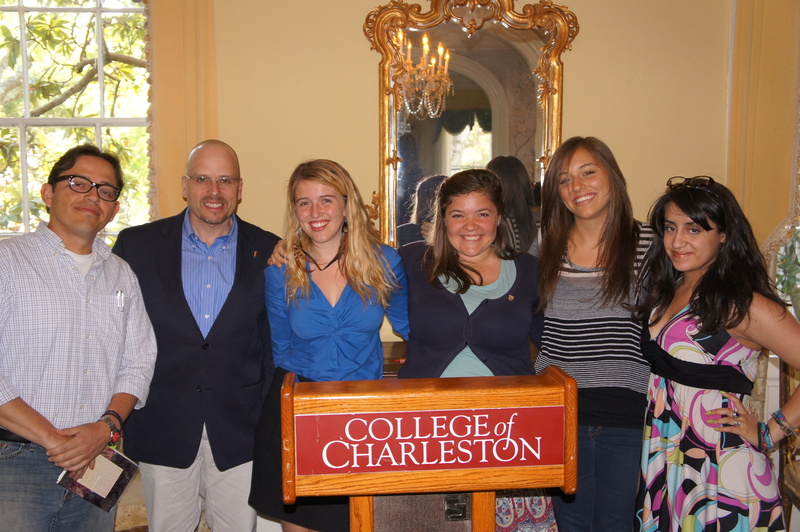 Spanish Poetry Night at the College of Charleston, April 9, 2012 at the Blacklock House. Professor Joseph Weyers’ article “Linguistic attitudes toward the tuteo and voseo in Montevideo, Uruguay” has been accepted for publication in Spanish in Context. Professor Elizabeth Martínez-Gibson was named “Faculty of the Year” for the School of Languages Cultures and World Affairs, and Dylan Kornegay (Spanish, December ’11) was recipient of the “Community Impact Award” at the 2012 ExCEL Award ceremony on April 4 in the Sottile Theatre. We also congratulate our newest Honorary Members: Professors Daniel Delgado and Claudia Moran. *Shannon Himes initiated the following afternoon.